I'm a Melbourne based freelance writer. I love getting out and exploring the city and beyond. If you enjoyed this article, please subscribe and you won't miss my future reviews! 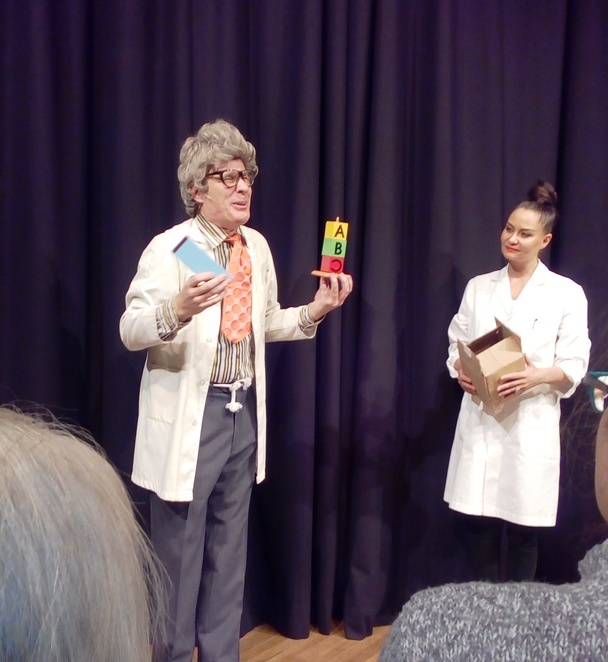 Tim Ellis is Professor Googalfitz – a zany science professor who performs a variety of magic tricks with the aid of his glamorous assistant Miss Pennybottom, played by Natalie. Professor Googalfitz and his assistant, Miss Pennybottom. 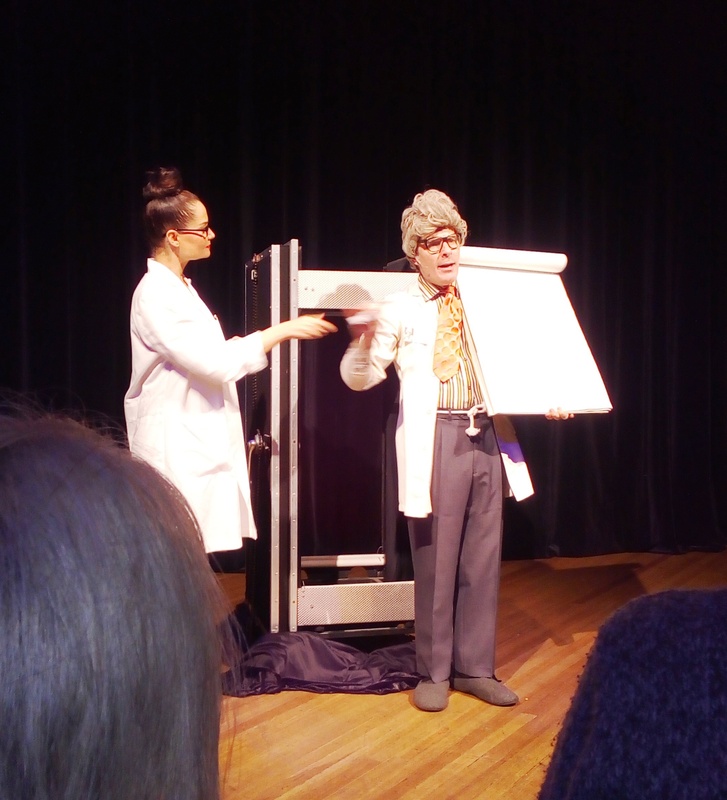 Performing at the Northcote Town Hall as part of the 10th Melbourne Magic Festival, Professor Googalfitz Explains it All is a fantastic show aimed at audiences 5 years and up. Adults will also be entertained and may remember Tim from performances on Young Talent Time. There are also references to Professor Julius Sumner Miller who many adults will remember from the famous advertisements for Cadbury chocolate. 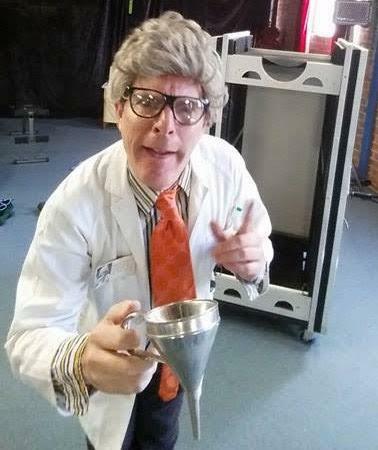 Professor Googalfitz certainly knew how to wow his target audience with his madcap antics and lots of audience participation. Within minutes of the show starting the first audience member, a young boy, was up on stage assisting with a trick involving a cup of milk seemingly upended on his head. How the professor managed to get the milk out of the cup without wetting the young boy's head was both inventive and entertaining. As the Artistic Director of the Melbourne Magic Show and President of The Australian Institute of Magic, Tim Ellis is a seasoned hand at entertaining crowds. This was a slick and very family friendly show and it is fair to say that there wasn't a pause in proceedings or a dull moment throughout. Professor Googalfitz and Miss Pennybottom wow the audience. As Professor Googalfitz, Tim connected easily with the young audience members and there were plenty of hands in the air every time volunteers were called for. He even managed to get some up to date music into his act to the delight of the youngsters, who always seem to enjoy seeing adults interacting with modern music! There were optical illusions, rope tricks and card tricks with a mixture of science, magic and general slapstick comedy. But perhaps the most amazing tricks were the illusions – one of which involved squashing the poor Miss Pennybottom until she was just 30cm tall. Part of the joy of magic shows is not understanding how the tricks are done and not knowing what to expect next. So for this reason, it's best not to detail each and every part of the act. For those budding magicians in the audience however, there are Professor Googalfitz books available to purchase after the show for $10 and a range of tricks for just $5 each. 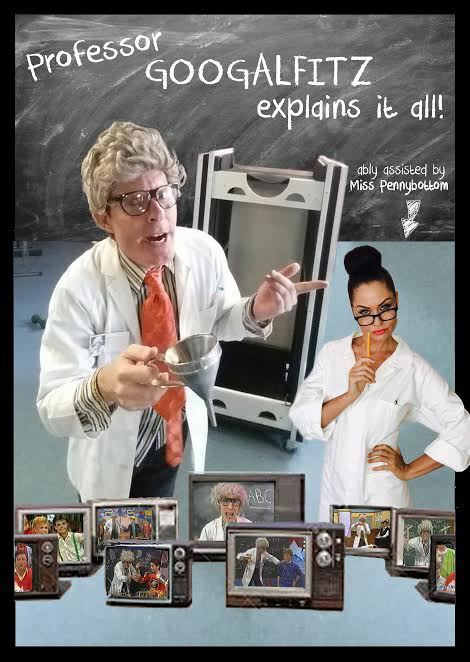 If you are looking for a fun family event that suits boys and girls, younger and older kids, then the wacky Professor Googalfitz fits the bill nicely. The promotional poster for the show. Why? To enjoy a family friendly magic show. Cost: A $24, C $18, F $70, other shows at the festival - prices vary depending on the show.